BPOS is short for Business Productivity Online Suite and is Microsoft’s cloud-based service similar to Google Apps. You get Exchange Online, SharePoint Online, Office Live Meeting, and Office Communications Online for a pretty low price per user (currently 85 SEK/month per user, minimum 5 seats). No need to host and manage your own servers, no mess of updating, patching, securing and backing up your server environment – amongst other benefits. There are a lot of articles and marketing material out there reflecting these benefits of BPOS and what cost benefits it will bring, and there’s also a lot of information on back-end migration processes, but the actual end user experience I’ve found very little on. Perhaps you will do thorough analysis, testing, configuring, packaging and deploying of the client components as part of the overall migration processes to BPOS, and if so, this problem will not apply as much to you and your users. However, presumably many corporations will align the strategy to move into the cloud with a strategy to move to BYOC (Bring Your Own Computer). You would therefore expect client-side components required for the cloud services, such as the Microsoft Online Services Sign In client, to be easy to install and configure so that users potentially can do it themselves. The client software itself is a simple download followed by a next-next-next-wizard, but when it starts to auto-configure your locally installed software (such as Internet Explorer, Outlook, Office Communicator and Live Meeting) that’s when problems start to arise. No idea why the Sign In client enabled this setting (no, it wasn’t enabled before) and disabling it will not work for all businesses since this setting may need to be enabled depending on your infrastructure setup. The point is; there’s a risk the Sign In client will make changes causing problems for your users. Do not leave it to them to install it themselves. 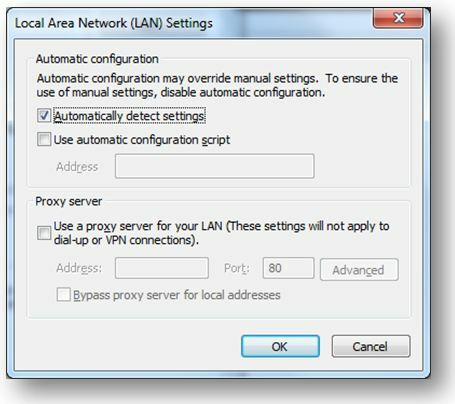 Another issue that may cause problems is that the Sign In client will create a new Outlook profile for BPOS/Exchange Online, meaning if users already were using Outlook with a default profile they will have to logoff and logon Outlook whenever they want to switch between mailbox accounts. That’s just not acceptable in the BYOC world. Do not expect novice users to be able to add BPOS as an additional mailbox to their current profile themselves (unless given very clear and specific instructions), the Outlook profile settings for BPOS are quite advanced. If users do end up with multiple Outlook profiles because of client auto-configuration, then the side effect may be that synchronization with mobile phones and other hand-held devices will not work as supposed to. In our tests, we had all sorts of problems with getting iTunes and iPhones to sync the correct mailbox and data once BPOS had done its auto-configuration. Also note that person-to-person audio and video communication can occur only between two PCs on the same corporate network where no firewall exist between the computers. 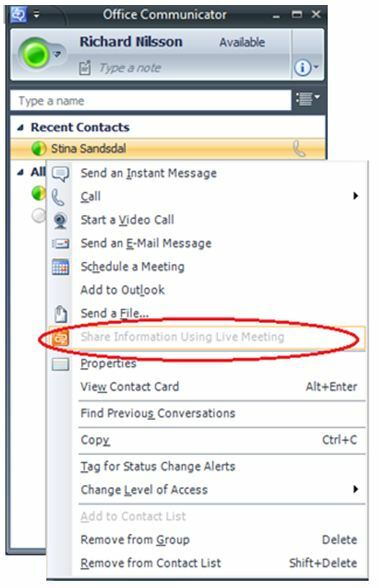 Normally if the LiveMeeting client is installed, the option “Share Information Using Live Meeting” is enabled in Office Communicator allowing you to select one or several users you want to collaborate / web conference with. You simply right-click and choose ‘Share Information Using live Meeting’, that’s all you need to kick off an ad-hoc LiveMeeting. 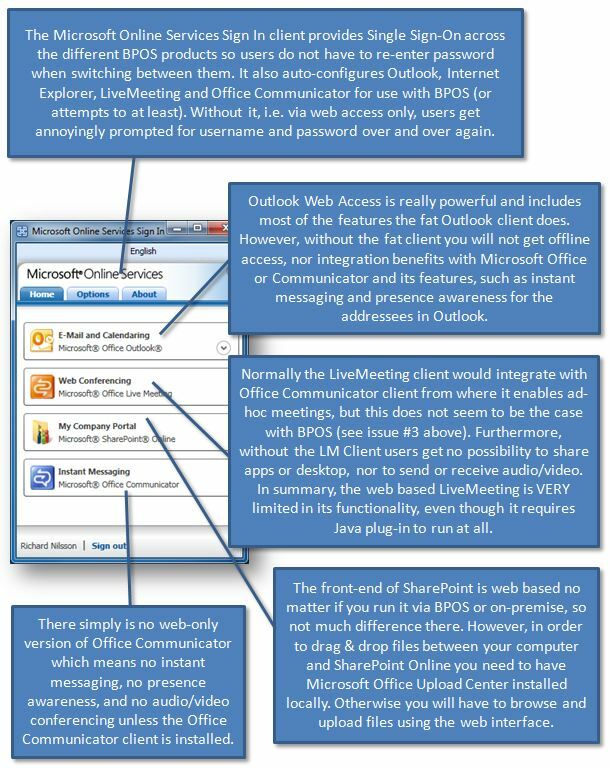 Without this option in Office Communicator users will have to initiate a LiveMeeting via the LiveMeeting web interface, which is anything from intuitive and easy to use. I’ve done usability tests previously in large organizations that prove this – very clearly. It’s easy enough to join an already set up LiveMeeting if you’re provided with a direct link, but to set up a meeting takes too long to even call it ad-hoc. There might be workarounds to this, but we have not been able to get any solution or workaround to this from Microsoft, nor find one ourselves. Imagine your business moves into the cloud and heads for BYOC and so on; your users are supposed to be able work from anywhere, any time and any device. It’s an old worn out slogan, but nevertheless it’s the vision for many businesses. Does BPOS support this vision? Not fully. For one thing, one of our pilot users was not even able to logon to BPOS using the Safari browser on Mac. The browser simply reloaded the page when trying to logon without even giving any errors. Unfortunately this was discovered at the end of our BPOS trial period so we never had the time and opportunity to dig any deeper into the issue. But even if you’re on a Windows client that is not part of your corporate network, for example if you use a temporary PC in an airport lounge or a coffee shop, then you will notice that BPOS is really designed to be used together with locally installed client components and software products (aka software-plus-services, which is Microsoft’s strategy) rather than through a thin client web-only interface (aka Software as a Service; SaaS). The picture below gives an overview of what features you will lose if you use BPOS through a web-only interface compared to if you use it together with locally installed client components and software products from Microsoft. Of course all client-side components that need to be installed to avoid the limitations with the web-only interface will result in resident processes occupying resources on your PC. When comparing Microsoft BPOS to Google Apps there’s a few other disadvantages with BPOS such as you need pay for and have Microsoft Office installed locally, and you cannot real-time co-author any documents. You will have to check-out and check-in documents when editing them and only way to collaborate real-time in authoring/editing documents is using LiveMeeting. 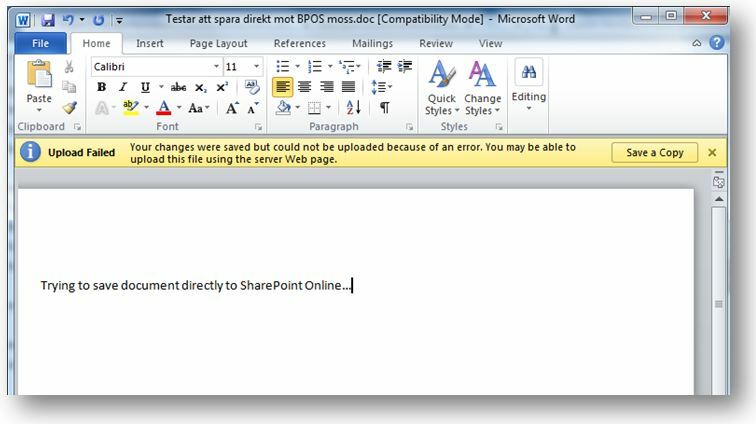 However, these shortages, including some of the issues and limitations listed above, will be addressed once BPOS will be based on SharePoint 2010 instead which will be released 12-May-2010. BPOS is expected to be upgraded to 2010 within 3-6 months after its release. You may want to consider not moving to BPOS until then, if your plan is to move. We’re currently also evaluating Google Apps in comparison to BPOS so next article will be about the User Experience of Google Apps. As a heads-up, if your users are custom to an on-premise Microsoft environment, then it’s very likely they are better off moving to BPOS than to Google Apps. Interested in evaluating BPOS on your own? Click here to attain a free 30-day trial version of BPOS from Microsoft through NeoSpot. Print article This entry was posted by Richard Nilsson on March 24, 2010 at 16:42, and is filed under All Articles. Follow any responses to this post through RSS 2.0. You can leave a response or trackback from your own site. Very informative article Richard, looking forward to the Google Apps comparison article. In short, the action is mislabled and shoud say, “Share Information Using Office Communicator”. 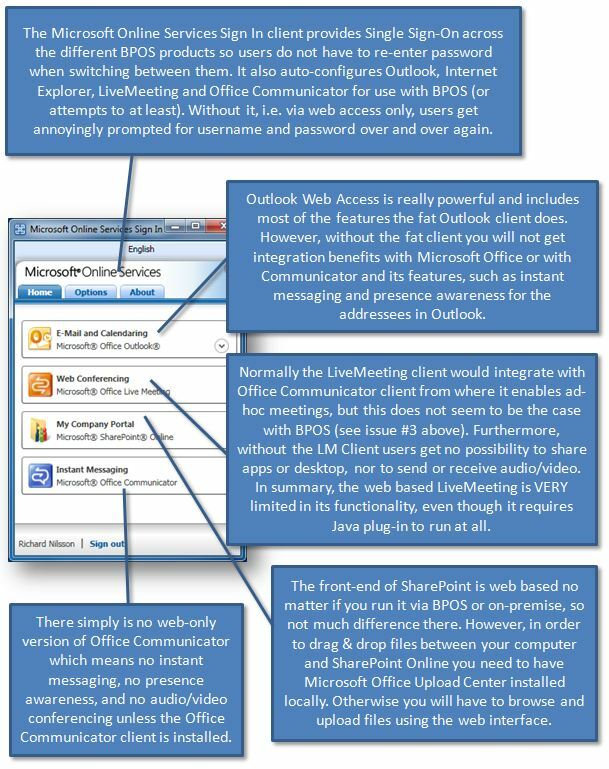 The action doesnt start a Live meeting using Microsoft’s Live meeting service, instead it starts a live meeting using Office Communicator Server if it is installed locally in your network. Good work! Regarding Issue 1. I have two comments. First, whenever you have an issue with BPOS, – installation of client applications or at any time – User the Support tab on the admin center to open a support ticket. Technical Support is free, fairly fast and accurate. Secondly, leaving end users with two Outlook profiles could be done, but this sounds like a symptom of testing. Custom Domains can be associated with your BPOS account, and once verified, an MX record change later new email is flowing through BPOS. For existing email on a local exchange server, use the Email Migration Tool to migrate Exchange data to the Cloud. Once data is online, you can remove the second outlook profile. 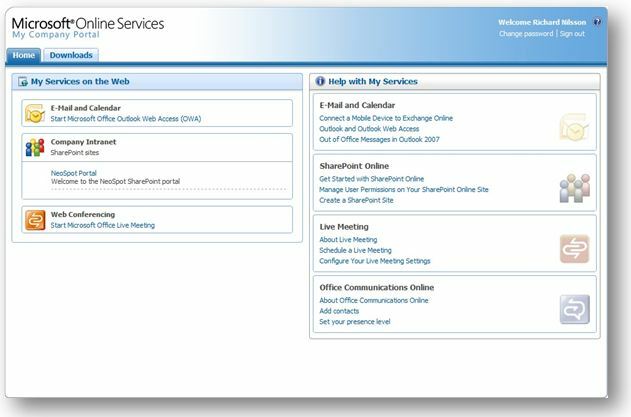 “Organizations using Exchange Online will have full Presence integration with Office Communications Server 2007 R2, including presence status in Outlook, calendar information for presence and out-of-office in Office Communicator. 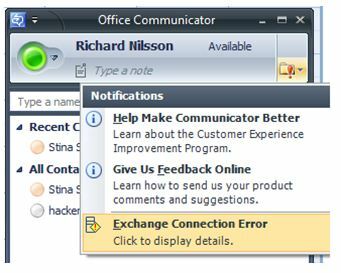 Note that the version of Office Communicator 2007 R2 must include the October 2009 update or later. To obtain this update please see http://support.microsoft.com/kb/972884.